2016 Porsche 911 Carrera 4S PDK review | What Car? The recent update to the Porsche 911 is no small tweak. Gone is the old model’s naturally aspirated 3.8-litre flat-six engine, and in its place is a smaller, twin-turbocharged 3.0-litre one. This is huge news to anyone fond of the brand, because turbocharging completely changes the character of an engine, and character is what the old car dished out in spades. Emissions and economy have improved, but – likely more interesting to most 911 buyers - is the 20bhp hike in power, and substantial 44lb ft boost in torque. As all that extra shove is reached at lower revs, it should also deliver lots more oomph without having to rev the engine as hard. Mated to the seven-speed dual-clutch automatic ‘PDK’ gearbox we’re testing here, it promises truly effortless, yet supercar-hassling performance. Other technical changes include a more responsive four-wheel drive system, tweaked stability control software, and new options including rear-wheel steering for more agile handling. The styling is similar to before, with a new rear spoiler, bumpers and headlights emulating the rest of the refreshed 911 range. The 4S models are further distinguished by a horizontal light bar between the new rear tail-lights. What does all this cost? Well, the price has risen by around £2500, so is it better to drive than the old model, and should you choose one over a Jaguar F-Type R AWD or BMW i8 Coupe? What’s the 2016 911 Carrera 4S like to drive? Well, the first point is that engine: is it any good, and does it still sound like a 911 should? Yes, and yes are the answers. Unlike the old car, which you had to rev beyond 4000rpm to get any real zing from, this new car is really punchy from just 1500rpm. It’s a lot easier to get the best from, and a lot easier to drive quickly. Being turbocharged means you don’t get the instant throttle response, but after just a momentary pause the new car picks up and surges forward with even greater ferocity, not letting up until it hits around 6500rpm. Thankfully, all those glorious noises that the old car used to make are still there. If you opt for the switchable sports exhaust, the noise echoes around the cabin and outside with added volume, too. It’s less pantomime than the F-Type’s V8 soundtrack, but no less enthralling. Another option worth considering is the Sport Chrono Package. This adds a rotary switch to the chunky steering wheel that allows you to pick from four different driving modes, and – with the PDK auto ‘box fitted - includes a Dynamic Response button as well. Should you spy an overtaking opportunity, press this and whatever mode you are in, the engine and gearbox are cranked up to the maximum for 20secs for a faster response. The PDK ‘box delivers smooth, quick-fire changes just when you want them, which makes life easy if you spend most of your time in traffic, yet is also joyfully responsive and thrilling in harder use. With all this pace you might imagine the 4S to be a real handful, but no; even in the wet it’s surefooted. 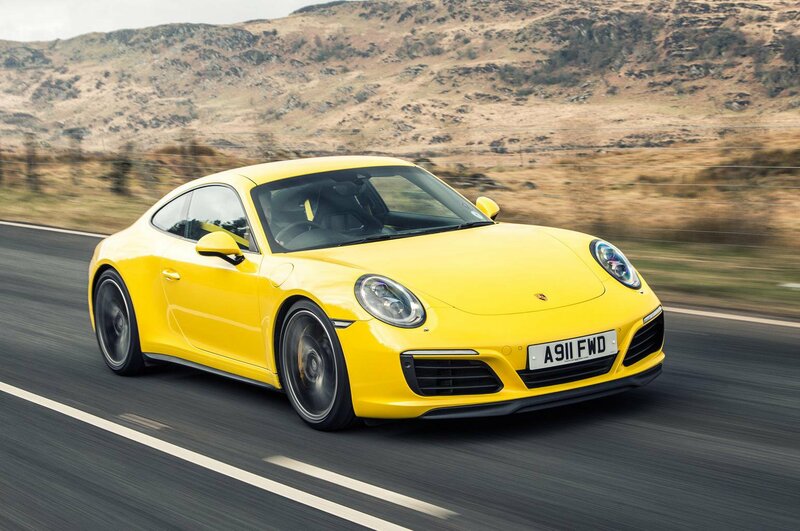 Coming out of corners you can accelerate earlier and faster than would be the case in the two-wheel-drive 911s, but it still feels engaging to drive, and nimbler than the Jaguar or BMW. In the sportier driving modes the standard sports suspension – lowered by 10mm in the 4S - and adaptive dampers keep the car planted at all times. Turn in to a corner and you feel the steering wheel weight up in your palms, letting you know how much grip is available. Just at the point the front wheels want to wash wide, the steering lightens, indicating it’s time to back off. When you do, the 4S stays nice and stable, with just a helpful little movement at the rear to tighten your line and restore grip to those front tyres. Its precise nature is a pleasure you can revel in, over and over again. Our car also came with a £1530 rear-wheel steering option, but it’s not worth paying the extra for. Yes, it's one of the best systems out there, not intrusive or unpredictable at all, and having had the opportunity to drive cars with and without back-to-back, you can feel the effect in the more aggressive turn-in to corners. However, complete with the active four-wheel drive, as well as the inherent poise and towering mechanical grip levels of the 911, handling purity and precision is not something that’s lacking if you don’t have the rear-wheel steering. On the flipside the Carrera 4S achieves that other 911 trait of being easy to live with when you want to amble along. In the softer Comfort setting the suspension is supple over most of the patchwork roads typical of the UK, although it is a sports car with quite firm suspension, and so the car bobs about over undulating surfaces, and you’ll feel fast compressions in your diaphragm. However, it's certainly comfortable enough by any standard to live up to the 911’s ‘everyday sportscar’ billing. Refinement is good, too, with very little wind noise even on the motorway, although the big tyres do generate a fair amount of road roar over coarse surfaces. What’s 2016 911 Carrera 4S like inside? It’s all very familiar to anyone used to recent 911s. The cabin’s quite plain next to the spaceship-like i8’s, but the materials feel robust and look more premium than an F-Type’s. The low-slung driving position immediately seems right, with the steering wheel, pedals and gearlever all perfectly placed. Despite the interior’s small proportions, it never feels cramped in the front either, even for those of above average height. In the rear it’s a different story. Like the i8, only kids can fit in the back seats, but that’s more than the two-seat F-Type can manage. When not in use they can be used for extra storage to complement the boot, which itself is roomier than an i8’s and about a on par with the F-Type’s. The new infotainment system is a big improvement over the old version. It’s more user-friendly than Jaguar’s similar touchscreen arrangement – faster to respond and with more intuitive menu layouts - but BMW’s iDrive beats them both for user friendliness. The 911 does have a slightly different character now, but if anything, this makes it better – and quicker - in everyday use. In fact, it comfortably out-performs both the Jaguar and the BMW, and despite the price rise, in manaul form it's the least expensive of the three. That’s not to say its rivals are without merit. They're each great cars and offer buyers something different: the F-Type is more old-school muscle car, while the i8 is futuristic and quirky.